The attack occurred in Ogossagou in the Mopti region in central Mali. Photo: HRW. Last Saturday, an attack on Fulani villagers in central Mali left 134 dead and 55 injured, including women and children. The attack left the village chief and his grandchildren dead. The victims of the massacre were reportedly “killed with guns and machetes,” and nearly all of the huts in the village were burned down. The attack was carried out by armed men reportedly dressed as traditional hunters. The hunters implicated in the attack are known as ethnic Dogon hunters who have long clashed with semi-nomadic Fulani herders — the targets in this attack. These clashes have been driven by disputes over access to land and water, but they have also veered into more dangerous territory. The Dogon accuse the Fulani of having ties to jihadists. According to HRW, a Dogon militia leader claimed that the Malian army has been unable to protect their villages against attacks by jihadists; as such, the Dogon set up their own self-defence groups. The Fulanis, on the other hand, claim to have come under attack from the Malian military. 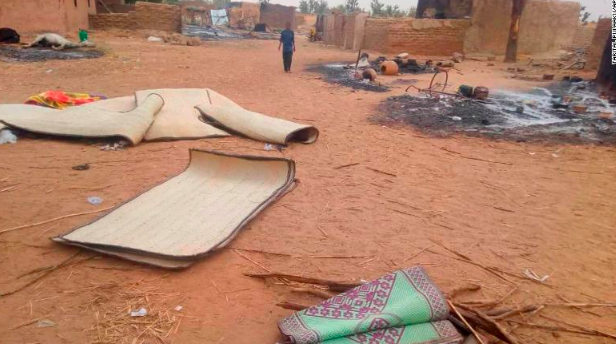 This attack is the latest iteration of growing tensions between ethnic groups in central Mali. Photo: CNN. On Sunday, Mali’s government agreed to ban the group of hunters that it believes to be responsible for all of the destruction. President Ibrahim Boubacar and the Council of Ministers announced the dissolution of Dan Na Ambassagou, a so-called Dogon self-defense group that has been accused before of targeting members of the Fulani ethnic group. However, it was not specified whether the Dan Na Ambassagou was responsible for the attacks. Saturday’s massacre took place as a delegation from the UN Security Council visited the Sahel region to assess the security situation in the area.